So, you want to dress Capitol for your next night on the town? 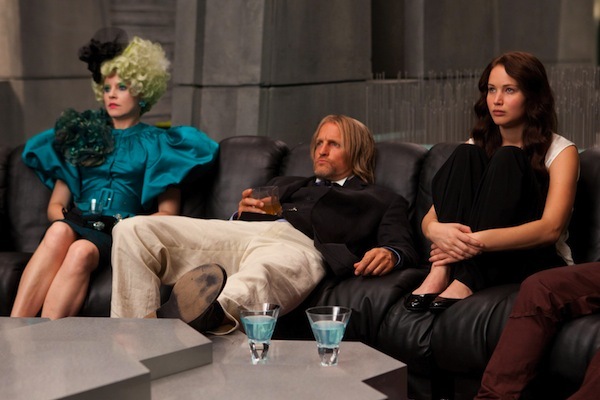 SheKnows asked Elizabeth Banks all the juicy details on how she styled out as Effie Trinket for her new movie The Hunger Games. Apparently, being Effie is about as high maintenance as it comes. “I loved that we used flowers and I had butterflies on my eyelashes,” says actress Elizabeth Banks as she sits down with SheKnows for a one-on-one interview to discuss the most important question of all — what was it like to transform herself into Effie Trinket for The Hunger Games? Based on the best-selling novel about a post-apocalyptic society that pits children against each other to fight to the death, The Hunger Games tracks the life of Katniss, the teenage girl from the poorest area of the country who is sent to the Capitol to fight. Banks was a huge fan of the book, so when she heard that director Gary Ross was attached to write and direct the film, she jumped at the chance to get onboard. “We made Seabiscuit together,” she says, reminding us of her adorable portrayal of Marcela Howard in the emotional drama about horse racing. “So, I sent him an email and said I wanted to play Effie,” she says. What did her old buddy Ross say to that? “Yeah, Banks, I know, I gotta find Katniss,” she says he replied. That cracked her up. But she understood immediately that his priority was to figure out who would play Katniss. Eventually, he cast Jennifer Lawrence to be his heroic archer from the poor region known as District 12. If you think that sounds tough, imagine not being able to use your cell phone. “I couldn’t type, I couldn’t blackberry, I could not do anything with the nails.” Banks had to soak her hands at the end of every day just to get them off. “The nails were impossible,” she says. When asked if there would be another fim in the series, Banks played cool. 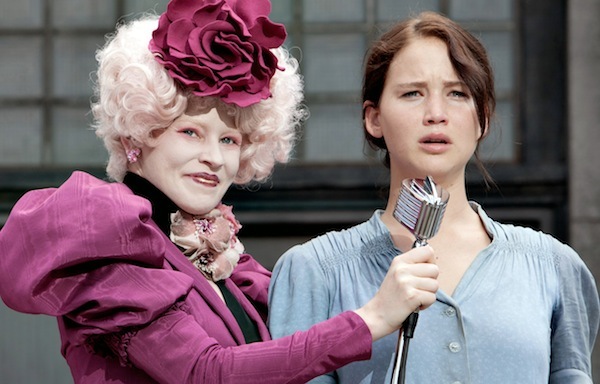 We know the filmmakers behind The Hunger Games have to be aware that the fan base wants more. But as for the details, they’re going to keep them under wraps for now. Oops. A set visit? Did that slip? Banks quickly covers. “If we get to make the next films,” she says. Don’t worry. Your Effie secret is safe with us. The Hunger Games releases in theaters March 23.